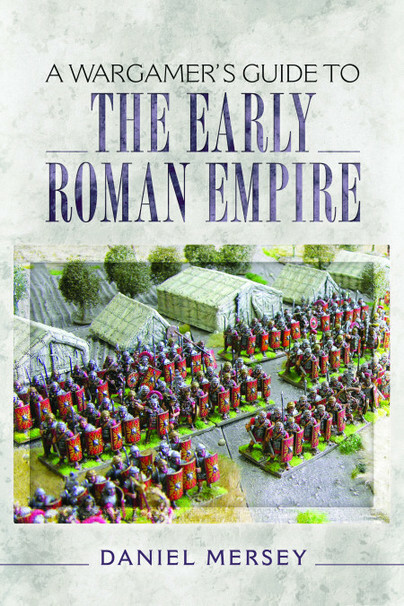 You'll be £12.99 closer to your next £10.00 credit when you purchase A Wargamer's Guide to the Early Roman Empire. What's this? The Roman army of the early empire is one of the most instantly recognizable armies and enjoys a reputation for excellence. This and their many famous campaigns against a wide range of colourful foes makes this one of the most popular periods for wargamers. Covering the period from 27BC to AD284, Daniel Mersey gives a wargamer’s perspective of the many conflicts and offers advice on how to recreate these on the gaming table. Advice is given on factors to consider when choosing an appropriate set of commercially available rules, or devising your own, to best suit the scale and style of battle you want and capture the flavour of the period. The relevant ranges of figures and terrain pieces and buildings are also reviewed. Analysis of the forces involved, organization, tactics and strategies will help with building your armies and there are interesting scenarios included. Whether this is a new period for you, or you are looking to refresh your existing interest in the period, this handy guide is sure to hold much if interest. A practical guide created in an intelligent way. The book contains several pictures and images showcasing how the tabletop legionnaires would face the barbarians. Without a doubt, these colourful figurines immediately capture one’s attention. In my opinion, this excellent introductory guide can serve as an effective educational material that could be utilized by schools and even by professional historians. I finished reading this book last night and thoroughly enjoyed it. Once again the author has hit the nail right on the head by concentrating on the wargaming side of the subject. Instead of a rambling history he sticks to the subject of fighting tabletop wargames of the era. There are similarities to the other books in the series in the layout style, but that seems to just help the author and reader to stay on track. I like the scenario section in the rear of the book and I can see myself playing a few of those at some time. Mersey has hit on a book style that experienced wargamers and the less experienced can share, particularly in the case of the experienced gamer who is not made to feel like a bumbling newbie! Even though I have played Ancients games, and read about it for years, I was still able to enjoy this without feeling he was talking down to me. I did however chuckle when he made mention of some of the earlier ancient rules and observed that they were written before he and probably most of the readers were born. Yep...I plead guilty to that young Daniel, I can remember arguments about each edition of the WRG rules as they were released and debate on which were the best. And I too have a copy of the WRG sixth edition! Of course he goes on to mention various other rule sets and leaves it up to the reader to choose which is preferred. Well done young fellow! This 'ancient' gamer enjoys your writing style. The book does exactly what it says on the tin, and then some more. This is a great resource for players who have a desire to play with an army from this period but are a little perplexed as to how to go about it, and the notes on how to game certain battles will help players design house rules for other battles not mentioned in the book. The centre pages have some nice colour photos of figures, and some of the paintwork will make even the best feel a little envious.